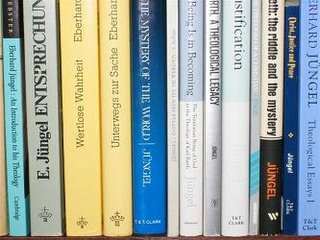 Jim West knows how deeply I admire the Tübingen theologian Eberhard Jüngel, and Jim has generously sent me his own copies of Jüngel’s works. This includes the important works Entsprechungen, Wertlose Wahrheit and Unterwegs zur Sache, as well as the German edition of Jüngel’s small masterpiece, Gottes Sein ist im Werden. As you can see, these volumes have made a very significant addition to my personal collection of Jüngel’s works. Within the next year or two, I’m hoping to write a couple of journal articles on Jüngel’s trinitarian theology—so these works will be an invaluable resource. Thanks, Jim!